2017 has been something of a breakthrough year for eSports. While the majority of sports marketers are still heralding eSports as the next big thing, gamers are just getting on with their thing, seemingly oblivious to the growing attention their activities are attracting. In the motorsport world, Formula E kicked off the year in style with the Las Vegas eRace at the Consumer Electronics Show, offering sim racers the chance to pocket a share of a cool $1m. 22-year-old Bono Huis walked away with the lion’s share, fending off professional racers for victory honours. More recently, Formula 1 and WRC have got in on the act. The second season of eSports WRC was held at the Hyundai Motorsport headquarters in Germany at the start of December. Frenchman TX3_NEXL was triumphant as he showcased his skills around some of the WRC’s most popular stages – virtually. A Hyundai i20 road car was his reward. SQN: Congratulations on your fantastic achievement Brendon! Have things changed much for you since you won the F1 Esports Series championship? BL: Thank you. It’s all bit a bit of a whirlwind! Straight after winning the championship in Abu Dhabi I would never have expected anything to be honest with you, but standing here today it’s completely different. I didn’t expect so much change in a short time. SQN: Could you tell us a little bit about your background in eSports and why you have particularly focused on racing games? BL: When I was younger I used to do motocross but ran out of funding for it. In 2010 Codemasters released their first F1 game and that was my calling card, so to speak, in finding a new way forward. My passion for racing games developed from this. SQN: So were you a fan of F1 before you started playing the games, or has it been the other way around, with playing the games getting you interested in the real thing? BL: I only started watching F1 from 2008 onwards and since 2010 I’ve been quite a big fan. Watching helps me massively as the teams have the telemetry and small bits of data that we don’t have access to as we don’t have a crew of 100 people around us! We can see what they are doing in real life and whether they are taking a slightly different line to what we take in the game. I would then use this information and test it for myself. SQN: Was the F1 Esports Series the first eSports championship that you entered? BL: I hadn’t taken part in an eSports competition on that scale before, just smaller competitions. In another competition I won tickets to the FIA Formula E London ePrix, but it was nothing like the scale of the F1 Esports Series final. SQN: Would we be correct in saying that you are part of the ESPORTS+CARS team run by Darren Cox? BL: Yes that’s correct. I was approached by ESPORTS+CARS Team Manager AJ Smith at the F1 Esports Series championship semi-finals in London. We had a general chat and then between the semi-finals and the final talks progressed and I then became a member of the team. SQN: What are the benefits of being part of the team? BL: It’s a very professional team; they’ve provided me with media training and I’ve learnt how to handle myself in front of a camera. A mind coach came out to Abu Dhabi to make sure I was in the best place possible for the final. 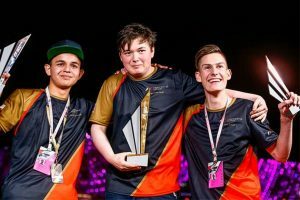 SQN: In your opinion, would you say that the first ever F1 Esports Series was a success? BL: I think it was amazingly run, especially for the first time, it was almost perfect. There were a few small technical bugs but those were more to do with equipment malfunctions. In terms of the organisation, it was 99.99% perfect. From a promotion perspective, I can’t really criticise them as it was their first time doing it and they didn’t really know what they could and couldn’t do and whether it was worth spending money on. I think next season we’ll see a true reflection of how much they wish to promote the series. SQN: How would you say that the F1 community has reacted to the introduction of the series? BL: The response has been quite good; there were a lot of people who followed the F1 social account who may not have understood what it was, and if you look at the response maybe 60% of them were wondering “why are we watching people play a game?” But once they got over that fact I think they realised that the racing was actually better than it had been in F1 all season. Then they understood it and got behind it. SQN: So do you think there is a risk that F1 might shoot itself in the foot by having an eSports competition that proves more exciting than the real thing? BL: F1 must find the right balance so not to embarrass itself, but in the grand scheme of things people aren’t going to spend thousands of pounds to go to Abu Dhabi to watch some people play a video game if we’re honest, they go for the actual race and that’s where F1 will always have an edge over the eSports side of it. But when people are sat at home paying for Sky, maybe they would much rather watch eSports than the actual race. SQN: And what about the eSports drivers like yourself, do you think there is a chance for your passion to become a profession? BL: I’d love to be able to turn professional. I said to people when I was at the semi-finals that I would work for the minimum wage if I got the opportunity to do it. I don’t think realistically it would be an option for another two years but once the opportunity is there I will definitely try and grab it with both hands. For us eSports drivers to have this chance to prove ourselves in a virtual world by driving a virtual F1 car is massive and possibly in a couple of years, it may even lead to some of the virtual drivers being able to move into a real-life racing car. SQN: That raises the question of sponsorship. Realistically, to turn your passion into a profession, do you think sponsorship is required? BL: Sponsorship is necessary if people want to make it their full-time job – sponsors have to be there. If people want to do it as a hobby and go away on the weekend to compete then the sponsors don’t need to be there as the costs can be covered by their actual jobs. As soon as people want to go pro, that’s where the sponsors have to come in to replace the money they’re losing from not having a job. SQN: Have you been approached about any sponsorship opportunities yet? BL: The option will be there in a couple of month’s time, I haven’t been approached or approached anyone myself because I just want to settle down after winning the final and catch up with everything first. The key thing is not to rush into a contract with a sponsor that might not benefit me. It’s a waiting game and choosing the right time to get what you want out of it. I put myself in a really good position in terms of sponsors, as did everyone in the top three of the F1 Esports Series. We were all great with the media, we’ve put ourselves in a good spotlight in terms of interviews and being really clean and really fast on track, so the sponsors might want to go to the top three first before going to other people. SQN: Have you noticed an increase in the number of sponsors entering the eSports environment?